If you’re a landlord, it can be quite difficult to know what your tenants are getting up to and whether they are taking good care of your property. It’s usually only when major problems emerge that a landlord will get involved. Such was the case with a recent customer of mine who owns a property in Stockport, a large town in Greater Manchester not too far south from the main city centre. The tenants of the property either neglected or didn’t know how to take care of the tiled shower walls in the bathroom. 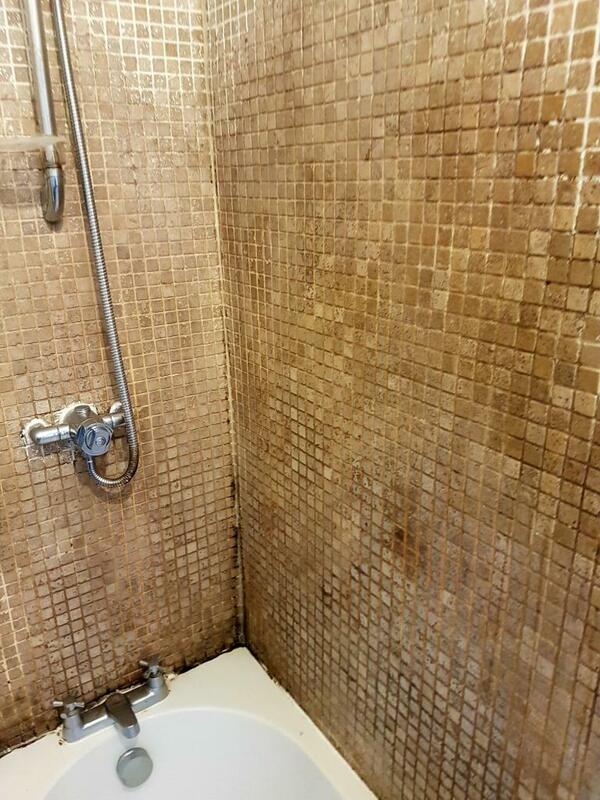 Over time, the condition of the tiles and grout had become so appalling that the landlord had to call Tile Doctor to see about restoring them. I began the restoration by cleaning the grout lines, which were truly filthy. This was done using a strong solution of Tile Doctor Pro Clean. 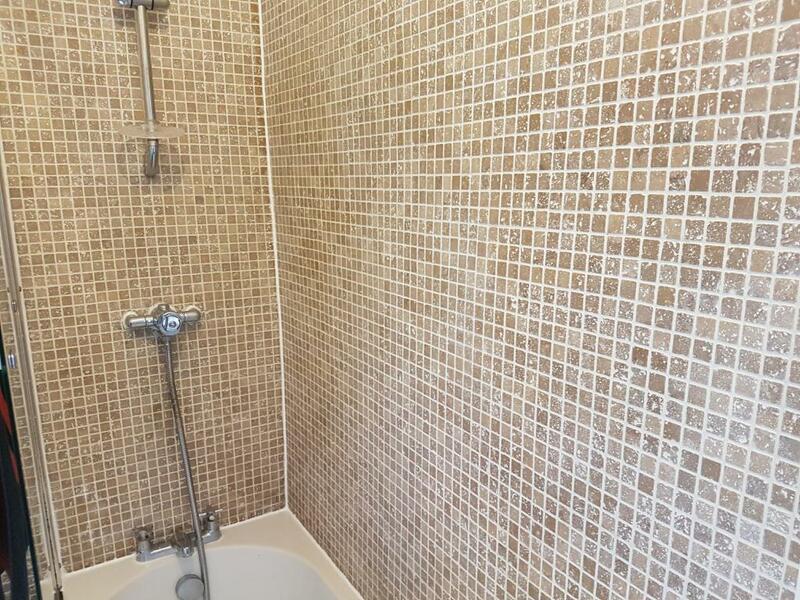 Pro-Clean is an ideal product for cleaning up neglected tiles and grout, since it removes all manner of dirt, including the soap scum and grease which had built up on these shower walls over the course of several months. The product was left to dwell for a couple of minutes before being scrubbed deep into the grout. The area was subsequently rinsed with fresh water to remove the soil. In some stubborn places, I didn’t achieve the desired result right away, so I repeated the cleaning process a couple of times. When the grout and tiles were cleaned to the best of my abilities, I used my heat gun to dry the walls quickly. Next, I removed all the mouldy silicone around the shower, a process which proved quite tricky because the tiles were all quite small, and there was newer silicone on top of old, very mouldy silicone, so I had to dig in deep to get it all out. After doing this, I had to clean and dry the gap between the tiles and the bath because the old mouldy silicone didn’t leave it in a pretty state. After everything was cleaned and dried, I sealed the walls using Tile Doctor Wall Tile and Grout Sealer Aerosol Spray. What makes this such a brilliant product is how easy it is to use. It is a spray-on sealer that adds long lasting protection against water, dirt, grease, mould and limescale. This reduces the amount of maintenance required. When I had finished sealing the tiles and grout, I applied new, high quality and mould resistant silicone. With that, the restoration was complete. The whole process took only a day’s work, but you must agree that a fantastic outcome was achieved. The landlord and tenants were very happy with it, remarking that if they didn’t know any better, they would’ve thought it was a brand-new installation.